A Westbrook Junior College student stands on the campus Green dressed in her May Day costume in this sepia toned candid snapshot labeled '35 on the front. On the back of the photo is written in blue ink: Beulah Cunningham. 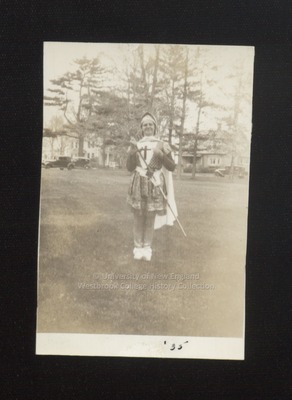 Beulah's costume resembles that of a Knight's Templar and that of a majorette. She wears a headpiece and a cape, and she holds a standard or long baton.